Susan Hais has been included in Marquis Who’s Who. As in all Marquis Who’s Who biographical volumes, individuals profiled are selected on the basis of current reference value. Factors such as position, noteworthy accomplishments, visibility, and prominence in a field are all taken into account during the selection process. With more than 40 years of experience in the legal industry, Ms. Hais has served as a founding partner of Hais, Hais, & Goldberger since 2002, having grown the firm out of her private practice she had begun in 1979. In this position, she represents clients in all aspects of family, and is renowned in the St. Louis, MO area for her work on complex divorce litigation involving financial interests, tax issues, child custody, and child support. Ms. Hais began her career as a student at Washington University in St. Louis, obtaining a Bachelor of Arts in 1970. Intending to pursue a career in academia, she completed a Master of Arts in English in 1971 at St. Louis University, but a professor advised her that a legal career might be better suited for her. She joined the St. Louis University School of Law, earning a JD in 1974, and she obtained a mediation certificate. She has been admitted to practice in the state of Missouri, as well as before the United States Supreme Court, the United States Claims Court, the United States Federal Court, and the United States Court of Appeals. She is a member of the American Bar Association, the Missouri Bar Association, and the Lawyers Association, where she served as the first female officer as secretary. For her outstanding contributions to her industry, Ms. Hais was recognized as the 2012 and 2009 Highest Profile Attorney in St. Louis by Ladue News, and she has been commended with the Women of Substance Award. She has spoken as an expert on family law topics at multiple conferences, and she has received numerous reversals from the Court of Appeals as well as from the Supreme Court of Missouri. However, she most enjoys helping people seek justice and finds satisfaction and meaning in helping parents successfully fight for custody of a child. Ms. Hais is married to Samuel J Hais, a former family court judge of 25 years and partner at her firm since 2002. They are the proud parents of two children. Looking toward the future, Ms. Hais intends to continue her career at the firm, improving the quality of legal representation offered and expanding the knowledge and skills of the lawyers. Click here for full article at whoswhoofprofessionalwomen.com. ​As a testament to her achievements, Mrs. Hais was recognized as the Highest Profile Attorney in St. Louis by Ladue News in 2012 and as the Most High Profile Divorce Attorney in St. Louis by Ladue News in 2009. She was also honored with the Women of Substance Award. She attributes her success to the fact that she likes people and listens to them; she fights hard for her clients. Additionally, she ensures she remains up to date with developments in her field through affiliation with the ABA and the Lawyers Association. Starting out, attorney Susan Hais had a different vision of her career path. Along the way, she learned that she was actually chasing another dream – one in which she served the greater good. Focusing on family law allowed Susan to give others a chance at healing and, ultimately, happiness. When she entered the field though, not many women were present. Susan discovered that this scarcity allowed her to make a mark. Her background in the humanities served her remarkably well. Her husband, Sam, who spent 25 years as a judge and now works on the other side of the bench, describes the difficulties that Susan overcame. “It was a challenge in the court of law, particularly in a field as potentially acrimonious as family law, for women to feel heard. They encountered huge obstacles in the form of stereotypes,” he says. Helping others in their pursuit of happiness assures Susan that she chose the right career path. Alongside her husband and fellow partners at Hais, Hais & Goldberger, P.C., Susan has discovered joy in impacting clients’ lives for the better. “The experiences Susan and I have shared over the course of our careers will always be precious to us,” Sam says. The Haises call their firm a “boutique” operation – a method that seems to work well for them. Although they want to keep their firm small, they’ve added new lawyers when necessary to handle the workload. They’ve even promoted one of their young lawyers, Erin Zielinsky, to partner. Different lawyers have different ways of dealing with a file. Susan and Sam oversee every file that comes into the office, but Susan calls herself a “midfielder,” of sorts. 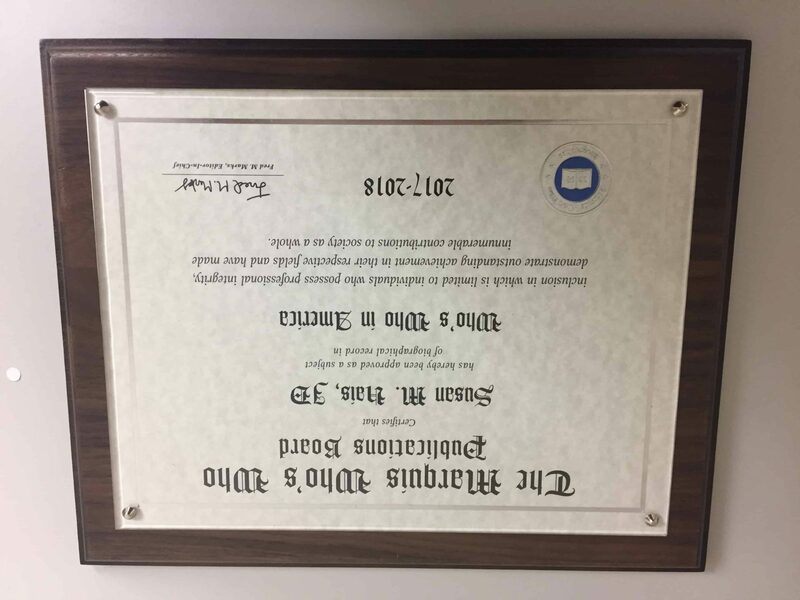 Hais, Hais & Goldberger attorneys have become so good at handling cases that oftentimes they get referrals from other law firms. This is generally the case with high-conflict cases, which the Hais, Hais & Goldberger team is able to handle. Susan says that sometimes, a client will think the case will be resolved quickly, and it turns into a high-conflict situation. In other cases, a high-conflict case is easily resolved. “You never actually know until a case begins,” she says. All in all, the Haises say they feel very fortunate and grateful to the public, their clients and friends for the trust they place in the firm’s attorneys. Click here for full article at laduenews.com. 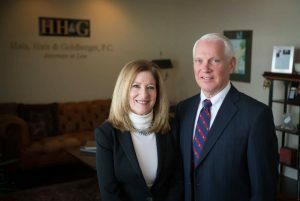 Hais, Hais & Goldberger is a full-service family-law firm, limiting its practice to complex divorce cases and modifications of decrees, custody, property division and support, business and professional practice valuations, stock options, tax-related divorce issues, pension problems, and enforcement of decrees. Its core staff of fulltime attorneys and paralegals has provided in-depth client services, meticulous case preparation, and complete litigation management throughout the firm’s 36-year history. Additionally, the firm employs an extended group of financial experts, tax- and pension benefits professionals, therapists, psychologists, and vocational experts to provide the highest level of preparation possible in its trial presentations. Since launching the firm in 1979, founder Susan M. Hais has represented many of St. Louis’ most prominent citizens from a great variety of professions and occupations and has been personally responsible for the establishment of an impressive array of legal precedents in the areas of divorce law, child custody, benefits, grandparents’ rights, property division, and spousal support. Samuel J. Hais, before joining the firm, was a judge of the 21st Judicial Circuit, St. Louis County, where he was a founding member and judge of the Family Court of St. Louis County for many years. Samuel and Susan have both written and lectured extensively in the area of family law. In 2007, the firm was proud to welcome partner Elliot Goldberger, who has practiced law for more than 25 years, concentrating on family law. Most recently, Erin Zielinski has been named a partner of the firm. She is a veteran of the practice of family law with 15-plus years of experience. Rounding out the associate attorneys are Pamela Ciskowski and Dzenana Delic. Very soon, Michelle Weldon will join the firm. She has recently graduated and shows great promise for the future. The guiding principle of Hais, Hais & Goldberger has always been to provide services in the practice area of family law in the most effective manner, to clients with the utmost level of professional integrity, at the fairest and most reasonable cost. Law is a complex field. 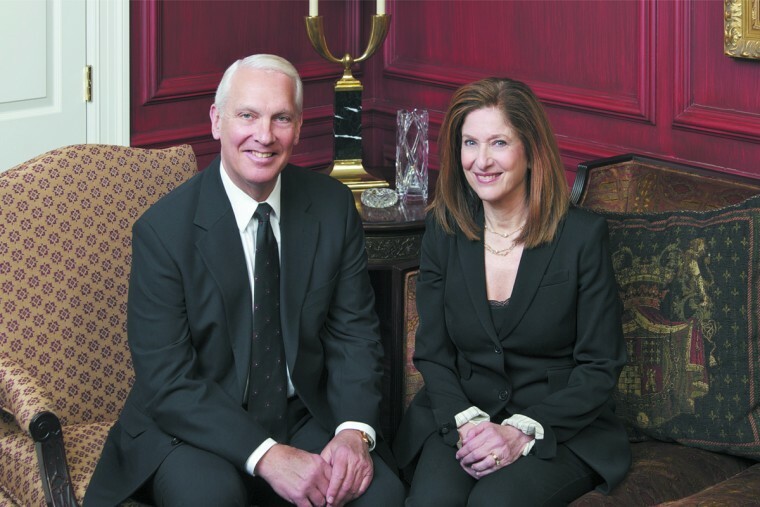 Susan and Sam Hais of Hais, Hais & Goldberger, P.C. know this, with a combined 60-plus years of practice in family law between the two of them. To the pair, practicing and keeping up with just one field of law is of the utmost importance. Hais, Hais & Goldberger is a law firm dedicated exclusively to the practice of family law in the greater St. Louis area. Its attorneys represent individuals in dissolution-of-marriage proceedings, legal separations, paternity cases, motions to modify child custody or support, proceedings to enforce existing decrees, child-relocation cases and family-law appeals. Susan says it’s often difficult to keep up with areas of law, since they’re changing all the time. Since Susan and her husband handle hundreds of cases, they’re able to assess patterns and fine-tune their skills with each case. They’re highly regarded in the St. Louis law community, as well as by former clients who keep in touch for years with cards and family photos. She’s been practicing family law for more than three decades; he was a family court judge for 26 years before joining her law firm in 2002. Impressive longevity, indeed, but Susan and Sam Hais seem to know the secret to successful long-term partnerships: The couple just celebrated their 32nd wedding anniversary. Divorce is never easy: Two people are dividing up their entire lives, with children, homes and assets involved. The process can be long and difficult, so it is imperative to choose the right attorney from the onset. “You want to make sure you know what you’re signing up for — that you know the way your lawyer practices — and pick the one who best fits your needs,” says Margo Green of Green Cordonnier & House. A client also should make sure that his or her potential attorney is willing to go to court and litigate, if it comes to that, instead of just settling or mediating the case. “We all have to be excellent negotiators, but we also have to be excellent trial lawyers,” Green says. When a client has a lot of assets to protect, he or she should look for attorneys who have an array of experts at their disposal to appraise the property, review investment and retirement accounts, and evaluate tax and insurance issues. “I wouldn’t want someone to ‘cut their teeth’ on an expensive, high-conflict divorce,” Hais says. Hais and her eight-attorney team focus exclusively on family law. Backed by experienced legal assistants and an attentive support staff, the firm tackles complex divorce litigation. “Life is more complicated than ever, and so is divorce,” she says. “These days, it’s not as simple as divvying up the pots and pans.” Divorce law has become increasingly technical and multifaceted; “We’re constantly analyzing tax issues and complex financial interests, including the evaluation of business partnerships, corporations and professional practices, as well as the division of pensions and appraisals of real estate,” she explains. “You have to be in the field full time to keep up. Often described as one of life’s most difficult experiences, divorce disrupts families and finances, and if the process is complicated with hostility and anger, it becomes even harder for everyone involved. 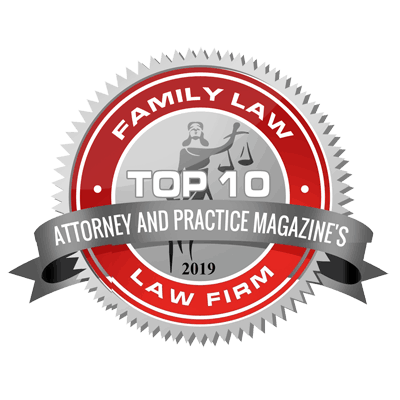 Family law attorneys, familiar with the intense emotions that most often accompany the dissolution of a marriage, have advice for couples facing this challenge. As veteran divorce attorneys, Hais and her husband and business partner, Sam Hais, and their partners Elliott Goldberger, Kerry Coyne, Amy Dennis and Robert Dennis occasionally meet with people who are unhappy with their choice of attorney. Usually, Susan Hais says, this problem can be avoided by the client doing some research before making a decision. “A doctor, therapist, clergyman, friend or family member can be a good referral source,” she says. Getting a lawyer with extensive courtroom experience is vital as well, Susan says. “You absolutely do not want a lawyer who is afraid to go into a courtroom,” she says. “It’s not that you want a domestic relations litigator because you expect to be litigating necessarily, but it is a wonderful insurance policy.” A lawyer with more litigation experience often has a better knowledge of each judge’s inclinations regarding various issues that might arise, she says. “Each judge is different, and it’s very important to know who is who.” A lawyer who knows the judge’s stance might be able to better advise the client. “Also ask, Are you going to be my lawyer or are you going to turn me over to someone else?” Susan says. Some law firms have one person dedicated to bringing in business, who then turns over the case to another lawyer. If you are comfortable with the lawyer from the first meeting, you want to keep contact with that person throughout the case, she says. Building strong attorney-client relationships has been key to their firm’s success, Sam says. “We sincerely appreciate our clients for making our work for them so rewarding and fulfilling. Hais says the bump in litigation could also be attributed to “a sense of unreality about the economy. If, for example, the husband had been the bigger income earner and is now unemployed or underemployed, and the wife has difficulty coming to terms with that, it must all be proven, and that creates the desire to litigate on the part of some clients,” she explains. Hais also reports a state of ‘economic warfare’ in the legal system. “Lawyers are reaching new heights of incivility to one another and even professional jealousy, which sometimes, regrettably, causes them to ‘go negative’ about their fellow attorneys,” Hais says. She is convinced there’s a better way, and advocates a comprehensive plan to address the funding of litigation in contested family court cases. “We believe it would help both sides understand that they are spending money to argue over money. It’s wasteful and unnecessary,” she insists. “We prefer a process that would explain the modification details to the judge in the beginning, with an estimate of the fees involved. Then have a specific marital asset or amount of money set aside in a fund, earmarked for those costs.” The concept has been discussed before, Hais says, but she hopes to help develop a workable plan that could be routinely implemented in the litigation process. Hais and her partners have adapted their fee structure in recognition of the economic downturn and its impact on their clients. “You see the struggle across the economic spectrum, and we are empathetic to those difficulties. We want our clients to know that the financial details can be worked out.” She is proud of her firm’s teamwork and loyalty in the midst of economic tough times. If a marriage is irrevocably headed for divorce, there is an option for couples hoping to avoid litigation, says attorney Alan Freed of Paule, Camazine & Blumenthal. Freed is trained as a mediator, and works with couples who want to settle their divorce amicably, without the acrimony that often accompanies courtroom proceedings. “Divorce is a problem to be solved, not a battle to be waged,” he says. “That’s what mediation is all about—it’s a problem-solving approach.” When a husband and wife meet with a mediator, he explains, they have an opportunity to explore complicated issues in depth and make decisions about how they want to proceed, rather than have a judge decide the terms of the dissolution. Alimony, along with child custody, is considered one of the greatest sources of litigation in family law cases, and 80 percent of divorce cases involve a request for modification of maintenance. The Haises say that the overwhelming majority of their business is referred by satisfied clients and members of the legal community. “That’s how you develop business, not just through websites or organizations, but by working 24/7 and earning a great reputation,” Susan says. The high price of justice is putting a squeeze on clients and attorneys alike these days. On the client side, individuals are postponing legal work and businesses are taking more legal work in-house. Consequently, a number of firms nationwide aren’t hiring as many associates as they used to; others have been forced to lay off employees. LN asked several top St. Louis attorneys what clients can do to tame the beast of billable hours. Look for experienced representation. “To save time and avoid costly mistakes, hire a lawyer who has a reputation for results and a solid crew of associates and paralegals,” Hais notes. Some women might take offense if their husband compared them to a pit bull, but not Susan Hais. Her husband and law partner of more than three decades uses the term lovingly to explain her success in what was once only a man’s world. 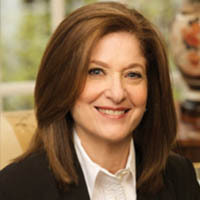 Founder of the law firm Hais, Hais, Goldberger and Coyne, Susan Hais has earned a reputation for being a successful divorce lawyer who pulls out all the stops. “Clients love her,” Sam says. “She thinks like Churchill: Never, never, never, never give up.” Susan confirms that. “I can’t stand unfairness,” she states. So when did all this purposefulness start? In part, during her entry into the law profession in 1974, at a time when female attorneys were not nearly as commonplace as they are today. “I had to be better,” she says, “more prepared. I wanted success more, more than anything.” Witnessing gender discrimination firsthand, combined with growing up in an achievement-driven household, laid the groundwork for the powerhouse her law firm would become. “We have a passion for justice and, some have said, a reputation for results,” says Sam, who joined his wife’s practice after years as a judge. The firm’s reputation has attracted both male and female clients, perhaps for different reasons, Sam ventures. Women may prefer female attorneys when relating the personal issues surrounding divorce, and men might believe that female attorneys have an edge with judges when it comes to family law cases. Susan agrees. “Sometimes women are embarrassed to talk about the issues,” she says, referring to infidelity, financial improprieties and other highly personal topics. And, she notes, women undergoing a divorce can be disillusioned with men, in general. “A lot of females are very angry at their spouses,” she says. On the flip side, men may believe that a powerful female attorney is more likely to intimidate a stay-at-home spouse. When the orange blossoms have wilted and ‘I do’ has turned into ‘I don’t anymore,’ it’s time for a smart divorce attorney. Susan Hais, founder of Hais, Hais & Goldberger, is just that. The solo practice she started 30 years ago has grown into a seven-attorney firm that focuses on family law. Hais is known to fight hard for her clients, but she also cares about what happens to them after that final decree is signed. “We do everything we can to minimize the devastating effects of divorce, so that our clients remember us not only as their advocate and protector, but as a facilitator of their future well-being,” she says. “And they lived happily ever after” might have been true back in the 1940s, when five out of six married couples stayed together til death did them part. But as times change, so do statistics. These days, the fairy tale often turns into a horror story, and half of all marriages end in divorce. Social trends may shift, but the needs of families in crisis remain constant. “People who are going through a painful divorce need an attorney who is thoroughly familiar with every nuance of family law and the family court system,” says attorney Susan Hais. That’s why her firm, Hais, Hais & Goldberger, P.C. focuses solely on family law, an area that deals with divorce, child custody and other complex, emotionally charged issues. Divorce is an increasingly complicated matter, involving the evaluation of financial matters and tax issues, disposition of marital property and debt, and knowledge of pension and bankruptcy laws, the Haises note. Child custody problems often require psychological or psychiatric evaluation and the use of vocational experts to resolve questions of maintenance and support. Because decisions made during a divorce affect the rest of a client’s life, and the lives of their children, too—it’s important to choose an attorney carefully, the Haises say. “Get a referral from a friend who has been through a divorce, or a trusted family adviser, like a clergyman,” Susan Hais advises. “Interview more than one attorney, if need be, until you feel a connection. Does he or she understand you, answer your questions, return your calls?” And make sure the firm has enough staff to take care of you. “We have a paralegal for each attorney,” she adds. When attorney Susan Hais, founder of Hais, Hais, Kallen & Goldberger P.C., graduated from Washington University as an undergraduate in 1970, her sights were set on a Ph.D. in English and a career as a college professor. But soon after starting a master’s program in the subject at Saint Louis University, Hais discovered a passion for law that has resulted in a long career and a reputation as one of the area’s most successful domestic law attorneys. “As a student of English, my main interest was in Charles Dickens, a great social critic,” says Hais. Did the famed English novelist inspire Hais’ own social inclinations? Perhaps, she says. “I was thrilled with my literature classes, but realized I was more passionate about law and how I could use it to help others, so I decided to enter law school.” At a time when women had just begun to make inroads in male-dominated fields like law, it wasn’t a common path. “I remember very clearly the day I went to visit Richard Childress, then dean of SLU’s law school. He was delighted with my decision and remained supportive of me and the other women in my class throughout our studies,” she says. To say Hais was outnumbered by male peers during her years in law school would be a gross understatement. “I was in classes of 200 students, and maybe six or seven of them were women. But I never felt at a disadvantage. In fact, I felt the opposite, I felt accepted and supported by my classmates and professors, many of whom I remain friends with today. Law school was a wonderful experience,” says Hais. Hais figured if she couldn’t find a job, she’d just start her own firm, which she did years later. “I eventually landed at a small firm that had a criminal lawyer and one who did civil work, including personal injury and domestic work,” she says. It was while working there that she discovered her passion for domestic law, and she eventually quit and decided to open her own practice. Hais’ gender quickly became an asset at that point in her career. “In family law, people wanted to hire females. Some clients were professional women who loved the idea of having a woman representing them,” she says. Her many male clients were also happy to have a woman lawyer, if for different reasons. “My male clients felt like I had an edge in court, and they were right to a certain extent. When dealing with the issues of children, women, marriage and relationships, they felt more comfortable pouring their hearts out to me than to men,” she says. When attorney Susan Hais graduated from law school, she was among only seven women in a class of 220. Clearly, these days the numbers are more balanced. But it was a different world back then, according to the founder of Hais, Hais, Kallen & Goldberger, who started practicing law in 1974. Divorce is one of life’s most emotional and stressful passages, and it’s important to find the right attorney, says Hais. “Ask your good friends about their experiences with their attorneys, that will tell it all,” she advises. In the practice of law, some firms, like transactional attorneys, thrive by becoming ‘mega-firms.’ But in the highly personalized atmosphere of divorce and divorce-related litigation, the goal is to grow big enough to offer a complete range of services, but stay small enough to give clients the personal, confidential service that makes them feel protected. A key component of that advantage is Hais’ managing partner and husband of almost 29 years, Sam Hais. “Sam was on the bench as a Family Court judge until 2002, when he came to work here,” she says. As managing partner, her husband is primarily involved with the business aspect of the firm. “He’s good with the clients and staff, and he has the ability to make things run smoother.” But more important, she adds, is his ability to weigh in on the legal issues from a judge’s perspective. “He’s involved in a lot of the cases, a lot of people come to him because of his experience as a judge,” Hais says. For his part, Sam Hais is focusing on the firm’s next 30 years. “We want to continue to provide the highest quality, most cost-effective legal services to clients,” he says. “Having grown over the years to its present mid-range size, our firm remains small enough to keep its services personalized and retain its ‘boutique’ character.” He adds that the firm’s partners, associates and legal assistants work together in a collaborative effort to carefully shepherd clients through the pitfalls of divorce. Partners include Craig Kallen and Elliot Goldberger and associates Amy and Robert Dennis, the other husband-and-wife duo. There aren’t many fairy tales left in modern marriage. It’s too hard to figure out the plot. And casting’s a nightmare—who’s the prince, and who’s the princess? We can’t even manage a fable; nobody can agree on the moral of the story. Martin and Mae Duggan say the man should lead and the woman should be his helpmeet. Andy Trivers says his marriage works because his wife, Kellie, “has a lot of male in her and I actually have a lot of female, and that makes us close.” Lawyers Sam and Susan Hais live peacefully, saving argument for the courtroom; archaeologists Michael and Deborah Cosmopoulos push each other into debate just for the fun of it. Howard and Vickie Denson pack their life with shared passions— business, travel, church, art and jazz—and the Triverses can’t even remember to make dinner reservations. Terry Crow and Thomas Peters compartmentalize for efficiency, Terry practicing law while Tom stays home with their small children; the Haises shared child care 50-50, and chores are done by whoever is available. Yet all six pairs are widely known to be “happily married,” the kind of couple you enjoy being around because there’s no covert sniping, no weary put-upon sighs, just ease and a quiet, continuing delight in each other’s company. The rest of us warm ourselves in their presence, wondering how—in an era without roles and rules, let alone magic spells and ivory towers—they do it. Sam Hais was 31, a state-court judge. Susan Steinberg was 30, a lawyer arguing a case in his courtroom, and she knocked him off his feet. He asked her out in November, proposed in January. Easygoing and entirely accepting, he was unlike any man Susan had ever known—and, at first, it threw her. Susan learned quickly to be glad of it. “Yeah, she was great,” Sam says. “She’s in Bologna now, studying international relations.” Their second daughter left for college three years ago, but Sam and Susan still eat next to each other because they can’t bear to sit in the girls’ places. “Dinner was a fun time for us,” explains Susan. “At the beginning, they used to wait for me to cook—well, that didn’t work so well, because I was always late. I remember Sam’s first experiments with cayenne pepper—the kids looked at me like, ‘What did Daddy do?’ and I just shrugged back. “He took them to all their sports practices,” Susan adds. “A lot of people have problems with control,” Susan interjects.